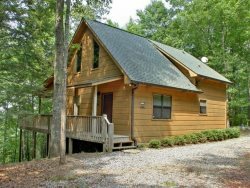 Georgia Mountain Cabin Rentals wants to make sure you receive the best price to value possible on your vacation rental in Blue Ridge, GA. Enjoying the great outdoors and all of our guest concierge services doesn't have to cost a fortune. Rest assured with Georgia Mountain Cabin Rentals you will receive a top quality cabin rental deal that will keep you coming back year after year. Check back often to view our current cabin rental deals and please read the following about applying a special to your next visit to the beautiful Blue Ridge Mountain Cabin Rentals. 1-877-656-7368. REMEMBER YOU MUST ASK FOR THESE SPECIALS/DISCOUNTS WHEN MAKING YOUR RESERVATION. Some restrictions apply. Specials can not be combined with any other discounts. Please remember we can only apply one special or discount per reservation. Active Duty or Retired Military personnel, Law Enforcement & Fire Department personnel receive a 5% Discount year round. A valid ID Card must be submitted before or at the time of check-in. If a valid card in the name of the reservation is not submitted this discount will be forfeited. This discount is available over Memorial Day weekend with a 3-night minimum reservation. All repeat Guests receive 5% off of their rate! To receive this special, you must have reserved a cabin with us in the past 2 years, and the reservation must have been under your name. Also, this 5% will be taken off of the lowest rate available at the time of reservation. This cannot combined with any other special or discount. It can be used during holidays and only applies to reservations where guest pays for 2 nights or longer. We appreciate you returning business, so please remember to ask specifically to get this applied.